Aurora Plastics' Streetsboro, Ohio, plant, which has the capacity to hold 18 rail cars, relies on rail transportation for raw material delivery, particularly for its five most used resins. Thermoplastic compounds company Aurora Plastics turns to automation for all the right resins. 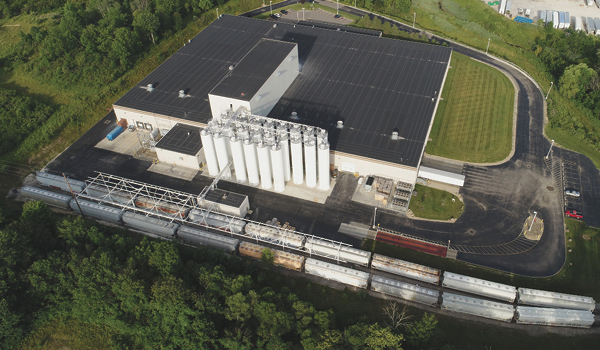 In 2017, Aurora Plastics LLC moved ahead with one of the last pieces of automation required at its Streetsboro, Ohio, plant: improving how it unloaded resin from rail cars to the correct dedicated raw material silos. With hardware from Janam Technologies LLC and a customized software application from Quest Integrated Solutions, the advanced polymer compounds developer and manufacturer eliminated time-consuming manual rail car content identification checks, improved its railyard management process, and delivered raw materials to their designated drop-off points with 100-percent accuracy. Aurora Plastics, founded in 1997 in Streetsboro, Ohio, develops thousands of advanced polymers, custom plastics, and compound SKUs for a spectrum of markets from agriculture and automotive to HVAC, custom extrusion, and injection molding. Achieved a 100-percent success rate for products being delivered to the correct locations at the Streetsboro, Ohio, plant through optimized data capture performance and reliability, combined with improved rail car and resin tagging and identification. Eliminated manual paperwork and multiple quality cross-checks, resulting in a 20-percent time savings overall. Freed up about two hours per day for the raw material coordinator, allowing the company to better utilize employee labor, time, and skills. Improved transaction and historical data tracking and reporting, as well as communications between the raw material management, production, and operations teams as a result of integrated rail car and railway yard data sent to Aurora Plastics' SQL database. Increased visibility and coordination of rail cars entering, staying in, and leaving the rail yard and improved communications with the rail carrier. Rolling out similar RFID tagging, identification, and automation processes to its recently acquired Pasadena, Texas, facility.